The hardest part of this recipe? Hands down, finding the phyllo cups. They seem to be something that not all grocery stores carry - in fact I had to go to three different stores. I found them at Meijer but I know that I have seen them before at Kroger, but of course not when I'm looking for them. You can find them in the freezer section, look in the area where the pre-made pie crusts, puff pastry, etc. can be found. Once you've found a couple of packages, you're only 10 minutes away from being done. 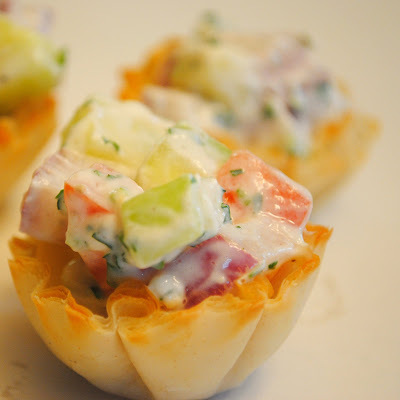 These would be a great appetizer for a bridal or baby shower, spring party or brunch since they are nice and light. I found this recipe on Brown Eyed Baker, she created it as 1 part of a 3 course menu for Breakstone's Triple Churned Challenge. Go vote for her menu (but hurry as tomorrow is the last day) and you have a chance to win $300! Click here to vote! 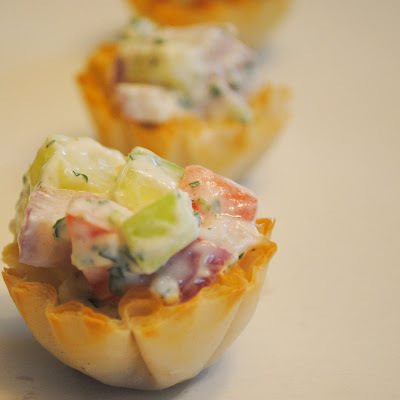 Let phyllo cups come to room temperature while you make the filling. Add the sour cream, cream cheese, and lemon juice to a medium bowl. Mix until well incorporated to make a dressing. Add the cucumber, tomato and onion and toss with the dressing. Add chives, parsley, salt and pepper and toss to distribute evenly. Spoon the filling into the phyllo cups and refrigerate until ready to serve. Looks delicious. Can't wait to serve this at our next party for an easy appetizer. I have found the phyllo cups at Walmart before. Looks yummy! They look great! I'm glad you were able to find the phyllo cups and enjoy the appetizer. Thank you also for the plug to vote, it is much appreciated!